Take the plunge and experience 60 seconds of freefall after jumping out of a plane from up to 15,000 ft! Touch down along the Wollongong Beach, the only beach skydive in Sydney! Strike one off the bucket list! It was a really great experience! Are you ready to take the plunge and feel the ultimate rush of adrenaline? You’ve chosen one of the best places on earth to make the leap! 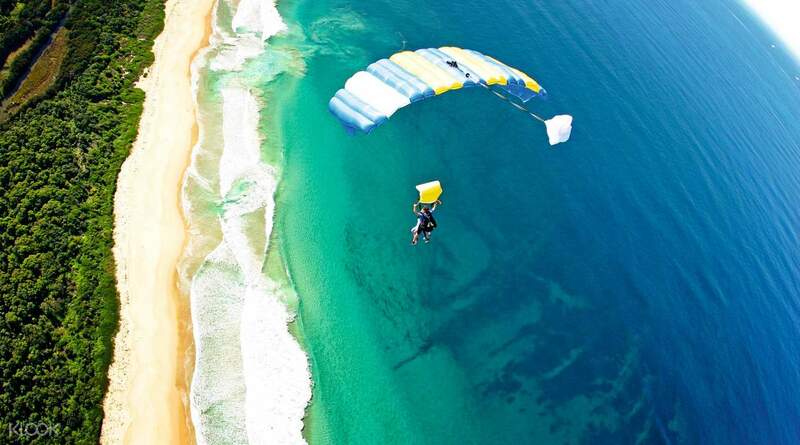 Calm your nerves as you make your way to Sydney's Wollongong Beach drop zone. At your chosen location, meet your skydiving support team, including your tandem jump master and safety officers who will train you on all safety procedures and answer any questions about your jump. Once weather conditions are cleared, get fitted into all your gear and take a quick flight to up to 15,000 ft. Your tandem jump master will attach your harness and will take care of all the technical details so you can just enjoy your experience. Ignore those butterflies in your stomach when the doors open and you feel the wind rush in. Leap out into the sky and try to enjoy the view as you freefall at speeds up to 200 km/hr for up to 60 seconds! Your tandem jump master will take care of deploying your parachute, and in case of emergency, all parachutes are equipped with the latest AAD technology to automatically engage at preset altitudes. Float through the sky for 5-7 minutes and enjoy a bird’s eye view of Sydney's southern beaches and coastline before landing on the Wollongong sand. A memorable experience you will never forget! 60 seconds of freefall from as high as 15,000 ft above Sydney! Glide above Sydney's southern beaches and land in the sand! Must do! Everything's perfect. They pick you up in Central station with their bus (easy to spot! ), their cool driver welcomes you and provides an overview on what will happen. Two hours later you're in Wollongong welcomed by the cheerful ladies and assist you in checking in. You will be pointed to the gear up station where they will assist in gearing you up for the jump. They will also brief you with the proper formation when you exit, jump and land. You will be met by your tandem instructor (and I tell you all of them are so cool!). Not a single instructor is quiet. They are all throwing out jokes so you can relax. Once you're good, you'll head to the Illawara airport for take off. When you're up in the sky, the view is very beautiful. Not scary at all. You have to try this when in Australia! Must do! Everything's perfect. They pick you up in Central station with their bus (easy to spot! ), their cool driver welcomes you and provides an overview on what will happen. Two hours later you're in Wollongong welcomed by the cheerful ladies and assist you in checking in. You will be pointed to the gear up station where they will assist in gearing you up for the jump. They will also brief you with the proper formation when you exit, jump and land. You will be met by your tandem instructor (and I tell you all of them are so cool!). Not a single instructor is quiet. They are all throwing out jokes so you can relax. Once you're good, you'll head to the Illawara airport for take off. When you're up in the sky, the view is very beautiful. Not scary at all. You have to try this when in Australia! thanks klook for bringing me here to this lifetime experience to be treasured Skydiving was my first ever breathtaking and a lifetime experience to be treasured! to those who are thrill seekers a must to try when you’re planning to visit Sydney. you will be amazed and enjoyed with this aerial sports. and thank you so much for this team for helping me out unlocking one of my bucketlists. I had a very great experience indeed! thanks klook for bringing me here to this lifetime experience to be treasured Skydiving was my first ever breathtaking and a lifetime experience to be treasured! to those who are thrill seekers a must to try when you’re planning to visit Sydney. you will be amazed and enjoyed with this aerial sports. and thank you so much for this team for helping me out unlocking one of my bucketlists. I had a very great experience indeed! Amazing experience I will never forget! Staff were friendly and will make you feel comfortable to lessen the fear! Amazing experience I will never forget! Staff were friendly and will make you feel comfortable to lessen the fear! It’s really amazing to experience the skydive in Wolloogong. Due to the weather was not good in Brisbane and we cancelled. Then I booked this in two days before and called the local center to confirm the booking. The local center is nice and helpful. It’s very convenient to meet up at the hostel opposite the Sydney central station at 8am and only took 2 hours bus to the skydive center. This is better than the time schedule of Brisbane. The personal tutor is also nice. There are some nice cafes nearby can enjoy after jump. The return bus is around 4pm. It’s really amazing to experience the skydive in Wolloogong. Due to the weather was not good in Brisbane and we cancelled. Then I booked this in two days before and called the local center to confirm the booking. The local center is nice and helpful. It’s very convenient to meet up at the hostel opposite the Sydney central station at 8am and only took 2 hours bus to the skydive center. This is better than the time schedule of Brisbane. The personal tutor is also nice. There are some nice cafes nearby can enjoy after jump. The return bus is around 4pm. Absolutely amazing! The instructors are professional, friendly and trustworthy. My instructor was Alex and he took great video! Thank you! I bought the package with ohotos and video in advance but you can choose to add on on the spot. The price is similar and you can also choose the third person filming. After paying and register, you have to wait for your group, then take a ride to the airport. The ride takes around 30mins. Then wait for the plane to get ready. The waiting part is the most nervous part! After that, nth to be scared of! Just jump out and enjoy! Absolutely amazing! The instructors are professional, friendly and trustworthy. My instructor was Alex and he took great video! Thank you! I bought the package with ohotos and video in advance but you can choose to add on on the spot. The price is similar and you can also choose the third person filming. After paying and register, you have to wait for your group, then take a ride to the airport. The ride takes around 30mins. Then wait for the plane to get ready. The waiting part is the most nervous part! After that, nth to be scared of! Just jump out and enjoy! It is a very good experience. The bus pick up is almost just on time! Many Participants. Skydiving is quite safe and coach is very friendly! If it is your first time to skydive, you may have to pay more attention to the posture instructions for landing etc. Even though I bought the handy cam and photos package, there is still another premium package to be bought on site for adding a camera man to film for you. I think that is not necessary though. It is a very good experience. The bus pick up is almost just on time! Many Participants. Skydiving is quite safe and coach is very friendly! If it is your first time to skydive, you may have to pay more attention to the posture instructions for landing etc. Even though I bought the handy cam and photos package, there is still another premium package to be bought on site for adding a camera man to film for you. I think that is not necessary though. It was so fun and amazing to join this skydiving activity. Klook did help us a lot for clarifying the refund issue if the weather is not good for skydiving. The instructor-Miles took a great picture and he is definitely professional. 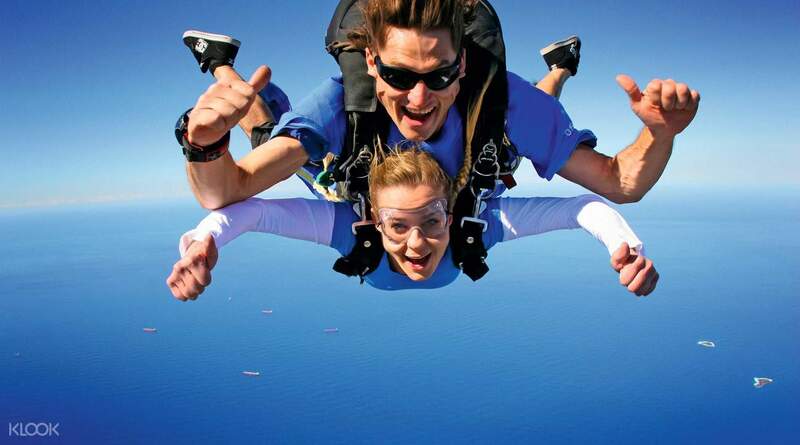 You won’t regret to try the skydiving in Wollongong. It was so fun and amazing to join this skydiving activity. Klook did help us a lot for clarifying the refund issue if the weather is not good for skydiving. The instructor-Miles took a great picture and he is definitely professional. You won’t regret to try the skydiving in Wollongong. Q: Can I bring a friend to watch me? Does my friend have to pay even if he/she will not be participating in the activity? A: Spectators are allowed to come for free, as long as they do not need pick up. If they need pick up, please call the operator one day before the activity to check availability and pay a surcharge of $30. However, spectators cannot go on the plane and will only be able to go until the check-in office.